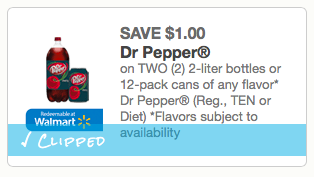 HOT New $1 Dr Pepper Coupon! Tag a friend to make sure they get the coupon before it disappears! Also upload your receipt to Savingstar for the $5 boost towards Dixie, Vanity Fair, Mezzetta, Banana Boat and Wet Ones. This week at Meijer 2l pop is part of the buy 10 for $10 and get the 11th free sale!! With coupon $1 on any 2 2-liter bottles or 12pk on any flavor Dr Pepper, it makes 2l Dr Pepper for only $0.50 each wyb2!